EXCEEDINGLY LIGHTWEIGHT – The full carbon construction is extremely lightweight which makes it easier to maneuver in the air during your hooked or unhooked tricks. Designed for women by women, the Soleil Textreme is the high-performance version of the Soleil, offering that extra bit of lightweight and bling. The Soleil Textreme is completely new to the range, especially designed for kitesurfing women, offering that extra bit of performance due to the extremely light Textreme Carbon. The Space Flex Technology makes it even lighter than it is anyway, yet makes it durable and giving this piece of art that little bit of extra pop. The narrow outline is one of the reasons the Soleil is smooth even in rough conditions, making the ride always controlled and comfortable. The softer flex in combination with the Space-Flex Technology ensures the ride is smooth, even on the choppiest of days and the Step Mono Concave bottom gets you going early. Of course, also the Soleil Textreme is equipped with the new rail handles, making handling of the board easy and helps you with this extra grip for any kind of grabs and board offs. With the Soleil Textreme, you get a female specific board which performs at any time on the water, but also could be art decorating your house. Either way, you´ll always have a smile on your face using the Soleil Textreme. 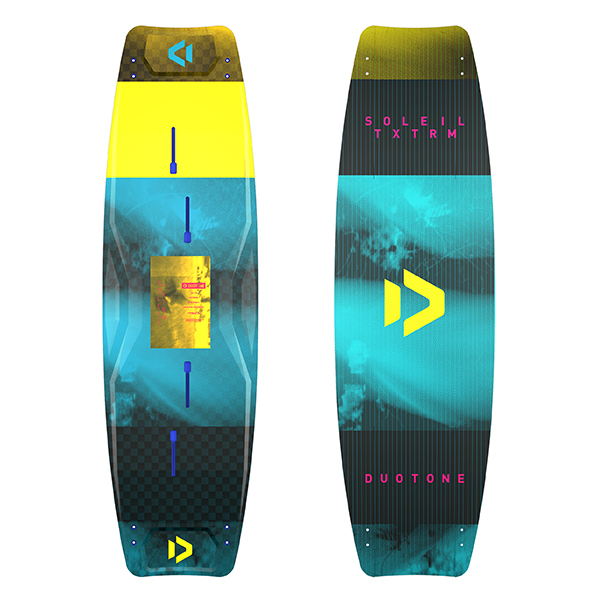 ***2019 Duotone Boards are supplied as a board only, including fins, please order binding or straps and pads separately. All Duotone Boards are compatible with the NTT Combi system & the Vario Combi system.